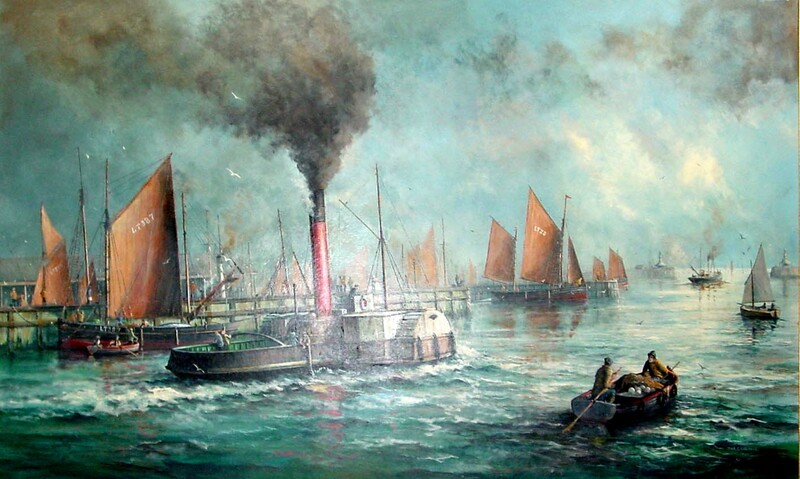 Joe Crowfoot’s large (1965mm x 1262mm ©1985) painting depicts Lowestoft Harbour as it must have looked at the end of the 19th century. Lit by the sun from the east it is clearly a morning scene and mist suggests the later months of the year. Many types of vessel are illustrated and a steam tug in the foreground with the other vessels in the bridge channel, are all heading eastwards drawing the eye toward the pier heads seen on the distant right. A dinghy being sculled in the bottom right has a cargo of drift nets with glass floats perhaps for delivery to one of the many fishing smacks, it suggests herring and November. In the distant left, we can see fish market buildings on the north side of the Trawl Dock from which the smack LT 23 is putting to sea. The harbour was built over the years from 1833 to 1837, see the Early Charts page. 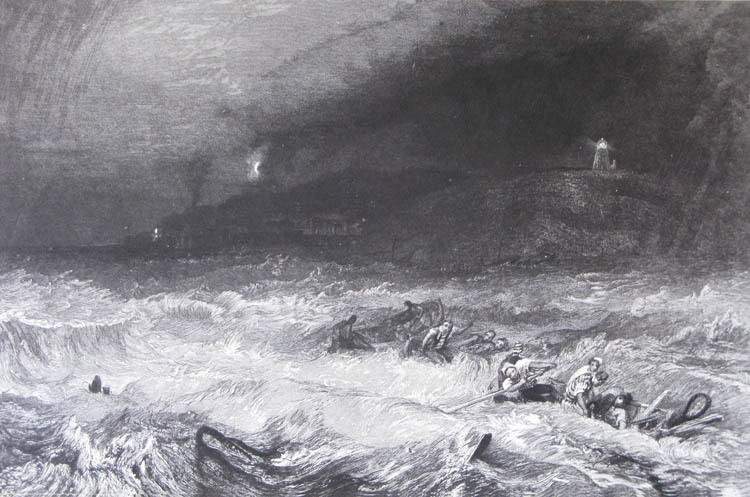 From an earlier period, the engraving below (230 x 135 mm) is taken from Turner’s Ports and Harbours, the only known illustration of the Lowlight and the Highlight lighthouses illuminated at night. The fishing village is huddled in darkness under the cliff, full of drama: Of course, a shipwreck in the foreground with a freezing wind from the south-east whipping spray from the wave crests. The foreground is strangely illuminated as if lighting the way to heaven for lost souls in the sea. There is a little path of light from the wreck to the beach below the Highlight for those who can reach it and the waves over the wreck are travelling toward the beach across the the direction of the running sea. Several of Turner’s paintings appear to use a shaft of light in a religious context and it was the engraver’s art that made such works accessible to the general public.